Since the loss of Net Neutrality it has become more important than ever to monitor the behavior of our Internet Service Providers (ISP). There are already reported instances of devious mechanisms being employed by these services in order to increase their ever-increasing bottom line. The ridiculous data cap system immediately comes to mind. It all boils down to greed, as I see it. They certainly don’t care about their customers, that’s for sure. 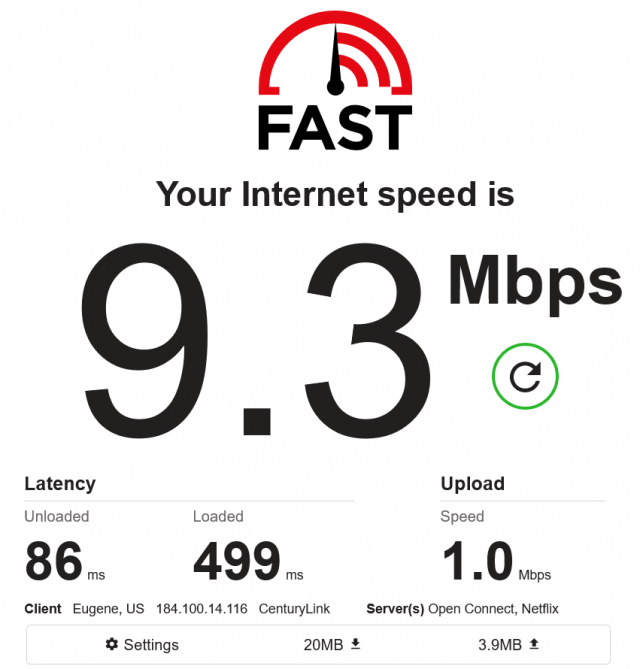 One of the things you can do is to make sure your transfer speeds are at least close to what the advertised speeds indicate, and that you are not paying for something you are not getting. It used to be, and maybe still applies, that if your download speeds are at 85% or greater of the advertised speeds, then you should be reasonably satisfied with your service. If it is regularly less than this, you should probably start making some phone calls. Strictly speaking, this Quick Tips article is not a specific Windows-related post, but I thought it was important enough to share with you in this series. 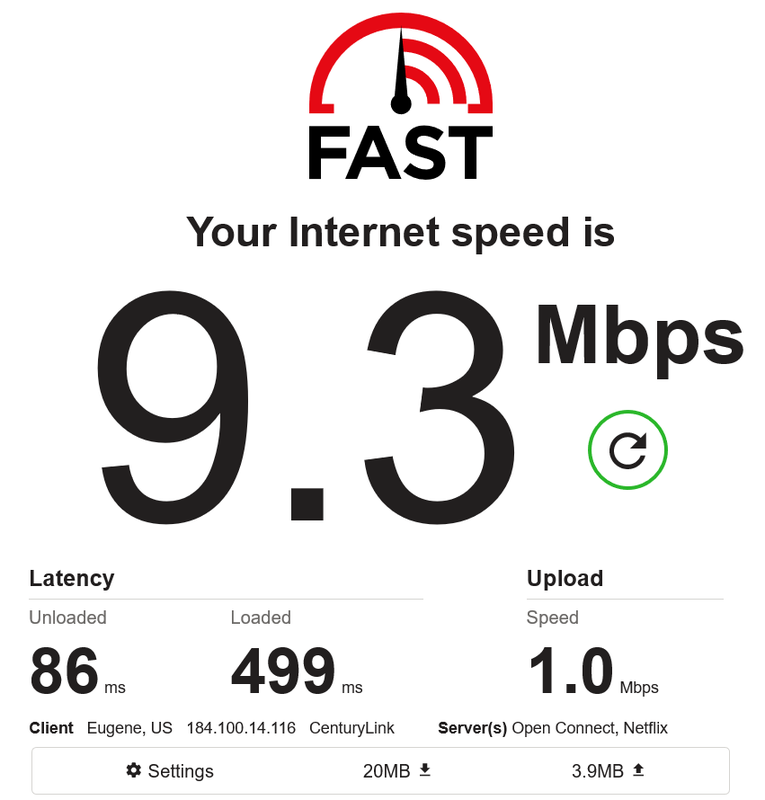 My ISP, CenturyLink, is providing me with an advertised download speed of 10 Megabits Per Second (Mbps). This is paltry by today’s standards, but it is too costly for me to upgrade to, say, a 25 Mbps package. And frankly, I don’t need it considering the type of internet work I do. It’s not like I’m downloading huge amounts of data or anything. In any case, the reported 9.3 Mbps is well above the aforementioned 85% rule. My upload speed is actually a bit faster than the .768 Mbps I should be expecting from my ISP. I don’t understand why the client is listed as Eugene, when the IP address points to a location in La Crosse, WI, but no matter. La Crosse is not that far from where I live. Unfortunately, unlike some other speed test sites, I saw no way to change this location on the Netflix site. If you would like to try this site out for yourself, head over to fast.com to see your personalized results. To get the most accurate results, you should run this test several time over the course of a day. Choose times when internet congestion is typically high. Try it again when congestion problems are minimal. And maybe a few other times scattered during the day, too. Keep a short record of your results and average them. You will then have a solid idea of what your throughput is over time. Also, if your times are consistently slow, it might be time to talk to your ISP and begin asking some hard questions. Tip: When talking to your ISP representative, remember that you will catch more flies with honey than you will with vinegar. I have gotten some really great price reductions by simply treating them as my best pal. You know, yucking it up with them like long-lost buddies. They have a tremendous amount of latitude when it comes to pricing and deals, so be nice to them. They are powerful entities and you should treat them as such. Anger will get you absolutely nowhere. There are many sites on the internet that offer this type of service. Tim Fisher over at Lifewire has published a comprehensive list of ISP-provided speed test sites at this Lifewire page. Hi Richard. I went a different route and discovered there is a reduction in both uploading and downloading when shielding oneself behind a VPN. Was only interested in the download results. Used three different sites for my testing and found that the time of day hardly mattered. To maintain the best accurate results, believe the computer or more accurately your modem should not be downloading anything else that could interfere with the test, Mindblower! A few years back we were in transition between two houses and finally got ADSL2+ at the second house ( which is now NBN FTTN ) so while i was sorting out the new account with the lady from Telstra the ISP… she gave me just over 50% off the original connection, from memory $70 to $35 a month which was very handy – Kevin. Your interesting articles are always appreciated. I check my connection on a regular basis to ensure “no rip-of” by my ‘net provider,and this is generally through Ookla, and also checked on my Android ‘phone. Download = 43.95 Mbps at 6.30pm on Saturday 22/918 in Oz during ‘Family TV Time. Upload = 35.38 Mbps at this time. These figures are not indicative of the 69.00 – 72 Mbps average readings over various times of the day, kids home from school, parents on Farcebook etc; during the week. With the Xirrus program it shows me that every neighbour within range have budget NBN plans which are relatively cheaper than the one that I use. These figures given are equal to Netflix USA through my VPN &Google. In our corner of the world the neighbours’ average download is 25 – 28 Mbps and that is the only slightly higher than the ADSL2 speed which I had prior to NBN.